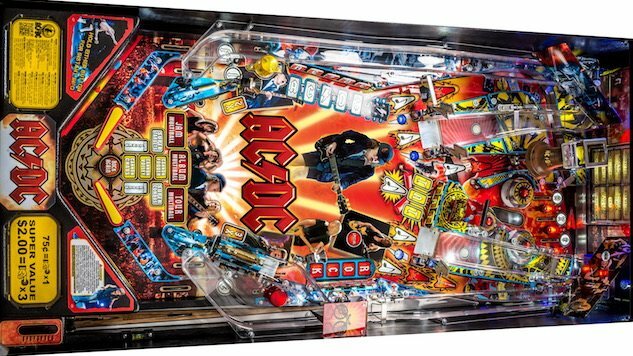 Stern Pinball, Inc.—the world’s oldest and largest producer of arcade-quality pinball machines—announced today that it’s bringing back its popular AC/DC pinball machines. Originally debuting in 2012, the AC/DC pinball machine honors the legendary band. The demand for the game from sweaty-palmed enthusiasts was so great, Stern couldn’t help but bring the machine back for an encore. ... two separate ramps, a lower playfield, a ball-shooting cannon, eight drop targets, a mechanized Hell’s Bell and animations of the AC/DC band. Players can also join the party with a TNT detonator and the Devil’s Jukebox. The AC/DC Pro features technological upgrades featuring all LED lighting and a swinging bell. This machine ain’t cheap, so you’d better start saving up right now. The pro version comes in at $6,099 while the premium version will set you back a solid $7,699. Look for this exciting pinball game in your local arcade—or inside your wealthy uncle’s mancave—or in the Paste office, right Stern?—soon, and watch AC/DC play “Highway to Hell” live circa 1979 via the Paste Cloud below.